Alfa Laval Niagara Wet Surface Air Coolers (WSAC®) are efficient closed-loop, evaporative cooling systems designed for the power, process, wastewater, natural gas and petrochemical industries. 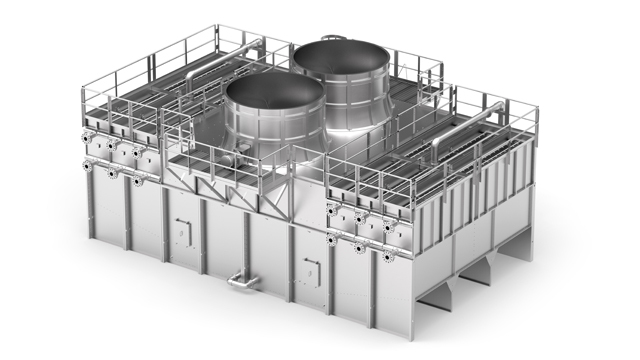 These fluid cooling and vapor condensing systems are optimizedfor industrial applications where rugged designs, and cost-effective, efficient closed-loop cooling and condensing duties are required. The challenge: An exploration and production company needed three systems to cool high pressure natural gas in a multistage compression system from 130 to 105ºF. The solution: Several customized closed-loop, evaporative Wet Surface Air Coolers were designed and manufactured. These units were modular factory assembled and tested with tube bundles designed and stamped per ASME code requirements for the design pressure at each stage of compression. They featured special screens for protection against hail and debris.